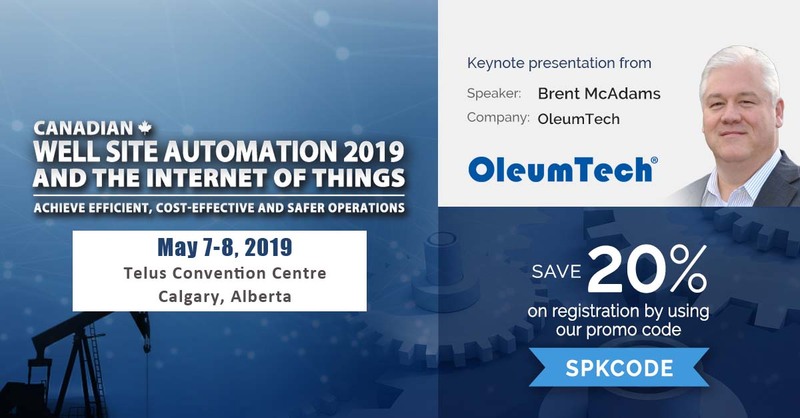 FOOTHILL RANCH, CA, April 3, 2019 – OleumTech, a leading provider of wireless IoT and industrial automation solutions, will be delivering the keynote presentation at the Canadian Well Site Automation Exhibition and Conference. The conference will take place May 7-8, 2019 at the Telus Convention Centre, Calgary, Alberta. “I am honored to be speaking at this year’s Well Site Automation and IoT Conference in Calgary, Alberta alongside industry experts from around the world,” said, Brent McAdams, Sr. Vice President, Global Strategic Initiatives. The Canadian Well Site Automation event will be a premier forum for well site automation and IoT (Internet of Things) across North America where shale operators and service companies will meet with automation experts and key technology providers in Calgary to explore efficient and cost effective well site solutions. The face of well site operations is fast changing as operators navigate through the ‘digital oilfield age’ and introduce new technologies across well sites and embrace the IoT. As operators adjust to a sub-$50 oil price market, new initiatives towards more efficient and cost effective operations have become essential in order to remain profitable in a low-margin business. While automation has reduced OpEx and CapEx costs and helped producers to survive in a low-price market, operators are now challenged with the growing risks associated with complexities of the digital oilfield. With new developments in well site technologies and technical know-how, recent advancements in automation offer new hope for producers looking for operational efficiencies under challenging market conditions, and to better manage their well sites. 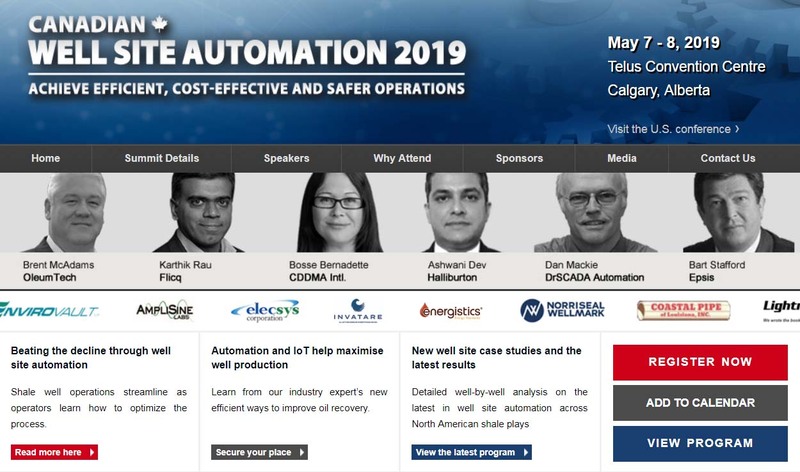 The Canadian Well Site Automation 2019 conference is set to become North America’s leading exhibition and conference exclusively for shale operators and technology experts, to present new solutions in well site automation and IoT applications for pre-existing wells and new operations. OleumTech is a leading manufacturer of wireless IoT communications and industrial automation solutions. For the past two decades, OleumTech has set the performance standards in M2M and IIoT communications with over 400,000 transmitters and 40,000 networks deployed. Our versatile products are distributed globally in oil and gas, refining/petrochemical, water/wastewater, and IoT applications that require industrially-hardened, battery-powered sensors and I/O networks. Headquartered in Foothill Ranch, CA, OleumTech is an ISO 9001 certified organization with a full commitment to excellence in delivering superior quality, reliability, and customer satisfaction. For more information, visit www.oleumtech.com and follow us on LinkedIn.